Seller will give you a gift certificate in the amount of 5,0622 RUB for a positive review of the product purchased. 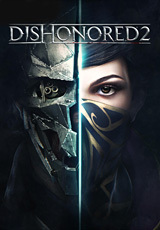 In Dishonored 2, the new chapter of the saga Dishonored, created by the Arkane Studios team, you will again find yourself in the role of a killer with supernatural abilities. You will return to an amazing world, combining magic, mysticism and technology. Decide whom to play: for Empress Emily Caldwin or for the defender of the crown, Corvo Attano. Choose a style of play: hide in the shadows, unnoticed bypassing enemies, use the whole arsenal of murderous tricks or combine these two styles as you like. Choose a unique combination of abilities, gears and equipment to easily destroy enemies. The game reacts to each of your decisions, and depending on your actions, each job can have a different outcome. - Emily Caldwin and Corvo Attano are fully voiced - they react to what is happening and give their assessment of the events in the game. Use supernatural powers, technical devices and unique weapons that suit your style of play: you can break through the city with a battle, destroying everyone who gets in your way, or quietly move around the roofs. And remember: you can always spare any enemy. - A deep system of creating bone charms and completely new improvements will allow you to customize your strengths and abilities the way you want. Become a living shadow and silently pursue your goal. Combine your enemies so that they share a common destiny, or immerse them in a trance and take possession of their mind. Combine different abilities with different types of weapons, decide where to join the battle, and where to avoid an open clash: the number of options is almost limitless, the choice is yours. - Gloomy streets of Danuollah, swarming with rats, the blooming coast of Karnak ... The best authors of Arcane Studios created truly unforgettable locations. The world of the game can be considered one of its full-fledged heroes: he has his own story, his own unique look, he has a lot of incredible, bright characters. But the most important thing in it is the place where the main action takes place: for example, you will have to visit the dusty quarter destroyed by storms and in the madman´s mansion - in a house with moving walls, deadly traps and sentry soldiers. - Customize the game and the level of complexity to your liking. Change any available options to facilitate or simplify the gameplay. Seller will give you a gift certificate in the amount of 5,0622 RUB for a positive review of the product purchased..